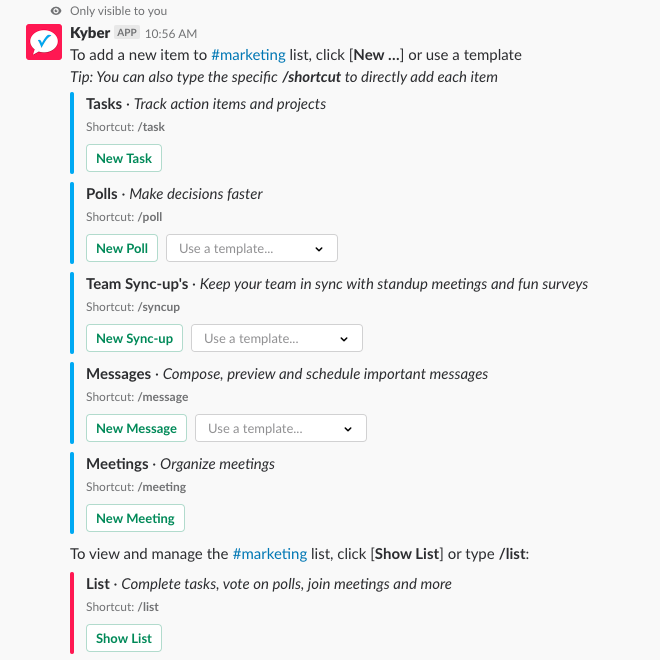 Kyber is an all-in-one suite of apps to make your team more productive inside Slack. Additionally, you can use pre-configured micro-apps designed to solve most common business cases and that you can easily customize to your specific team needs. You will be asked to sign in the Slack workplace you want to install Kyber to. 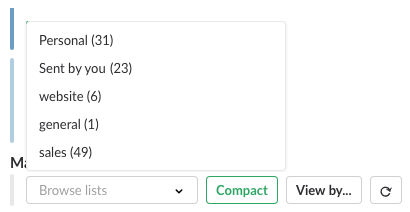 If already signed in one or more Slack workplaces, make sure you select from the drop down menu on the top right the Slack workplace you want to install Kyber to. Then, scroll down the page and click Authorize. Kyber is not installed in your Slack workplace and ready to use. 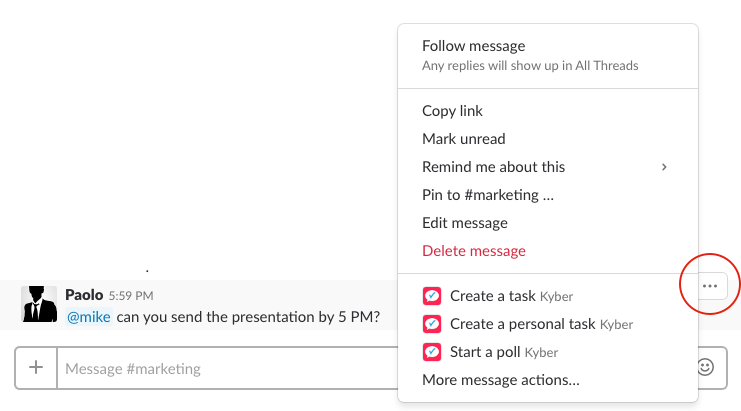 With Kyber you can create a variety of action items (tasks, standup meetings, polls, reminders, messages, etc) for each conversation. Go to any #channel, group or direct message and instead of sending a basic message, use Kyber to send and assign tasks to teammates, keep your team in sync with standup meetings, make faster decisions with polls, get a pulse of your team with surveys, remind people at a specified time, schedule messages for later, send meeting invites, check your calendar, get notified when tasks are completed, review poll results, alert people about upcoming meetings and much more. There are several ways to add items to each list and view them. Let’s explore them quickly to get you started. Once items are created, click [Show List] from the launchpad to view the list of items for that specific conversation. As part of the Kyber launchpad, you can find powerful and flexible micro-apps already pre-configured to cover a variety of common use cases. Pick a micro-app with [Use a micro-app… ▾], customize and configure it to your needs, preview it and run it! In few clicks you can build your own “micro-apps” and automate your own workflows with no coding required. Take a look at this video to get started with Kyber! Slack is the place where tasks and projects are continuously discussed and decisions are made. In fact, a simple message like “hey @mike, can you send the slides by tomorrow at 3 PM?” is actually a task that is assigned to @mike and it’s due by tomorrow at 3 PM. Dedicated Slack #channels are typically created to discuss specific project (e.g. #website-redesign, #release-sierra) or client and customer engagements (#smith, #walmart). The outcome of those conversations are tasks part of a larger plan that requires team collaboration and coordination. But remembering all those tasks sent as messages is a challenge; switching to external project management tool to track those decisions is time consuming and makes you lose the entire context of those conversations. Ultimately things are forgotten and don’t get done. Kyber can solve these problems by letting your team create a shared list of tasks per each Slack #channel. 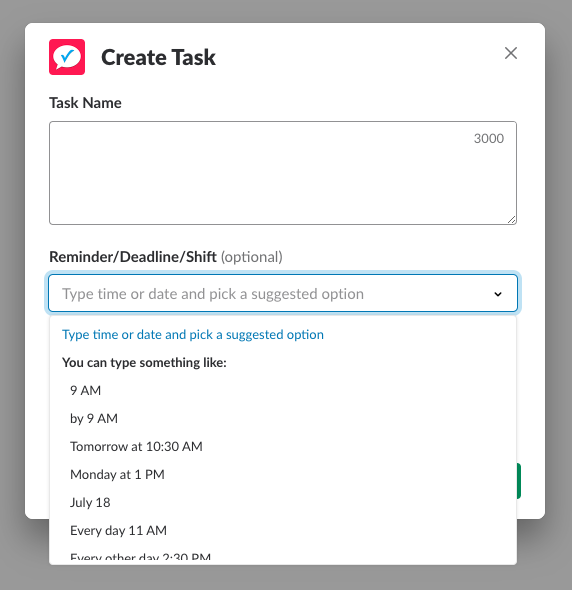 You can turn an existing message into a task, create and assign a new task, automatically notify assignees about due dates, follow up on task status, get notified when a task is completed, review and manage each project list like you would do in a project management tool, now all inside Slack. After you created the task, you might want edit the task right away, in case you forgot to assign it or want to add a file to it. See Show lists to learn how to display the same task actions at any time with /list and manage each action item. By default, a new task without a day or time (e.g. “Send slides for review”) is added to your list for today. Kyber sophisticated date and time picker is smart enough to offer suggestions based on what you started writing and deliver the right experience for you. In all cases, a timely alert is sent to the recipient to remind them about the task. With reminders and shifts, the task is showed only in the list of the specified day, while for deadlines the task is shown every day in the daily list until the deadline arrives to make sure you start working on it. Nothing will be forgotten, things will get done. Then, also use natural language to distinguish between reminders, deadlines/due dates and shits. When using the creation form, few smart suggestions are offered to simplify your data entry. Sometimes you don’t know when you are going to work on a task, but you still want to track it. In that case, you can use the “someday” keyword to add the task to the Someday list. The task is recorded and ready to be scheduled with [Plan] when you will have some time to do it. The Someday list is also useful when you have too many tasks in your daily list and want to snooze some for later with [Plan]. Keeping your daily list short is key to maintain focus and boost productivity. Some tasks need to be done regularly, every day, every week, every month. Instead of manually create each one of them, you can describe with your words the type of recurrence and Kyber will diligently setup a series of tasks that repeats. and many more. As usual, just write a natural sentence and Kyber will understand you. Recurring tasks are great to build team culture, apply best practices and instill good habits. 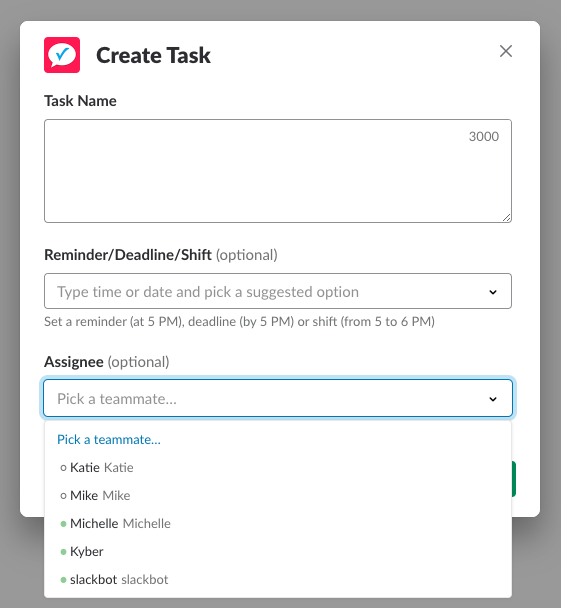 To assign the task at creation, simply select a teammate from the Assignee drop down menu. Let’s say you want to assign the task to Mike: click [Pick a teammate… ▾], select Mike directly or type some letters (e.g. “mik”) to quickly find it. If you want to assign the task later, type /list to see the entire task list along with action buttons. Then click [👤] to display your teammates. your own Sent by you list to track it until completion. When Mike completes the task, a notification is sent in the #channel to inform everyone of the progress. You might want to assign a task to more than teammate or to all the members of the conversation. Once a task is assigned to multiple teammates, each teammate has to mark it done before it is fully completed and removed from the shared list. After a user complete their task, their status is updated to ✓ to keep the rest of the team informed on their progress. If you don’t need to wait for everyone to complete their instance of the task, you can click on [✓ (for all)]. Note: Due to a current Slack limitation, it’s not possible to select multiple users from the Assignee drop down menu. Here is a temporary workaround. On the displayed drop down menu, click [Pick a teammate… ▾] and start adding assignees. Each time, you will be asked if you want to re-assign the task or add an assignee: click [Add]. To assign the task to each member of the #channel, including yourself, directly click [@channel]. When @channel is used, the task is assigned to everyone in that channel, including yourself. To remove a teammate you already assigned the task to, select it again. If you want to add a file already shared on Slack, use the [📎] button. The first time you will be prompted to grant a permission to access your files on Slack. After you have granted it, click again [📎] and select one of the files already uploaded on Slack in the current #channel. The file is now added to your task under the More Info link. To add a file to a task from your computer, upload it first to Slack (see instructions) and then use the [📎] button as described in Files on Slack. Turn off file previews on Slack if you don’t want to clutter your channels. To create and add a new file to a task, use the [📎] button and select either New Document… or New Snippet… from the menu. You can use rich formatting, collaborate, or share code with native Slack files. Each item can be independently completed to share the progress on the task. To comment on tasks click the 💬 at the end of the task name: a thread associated to the specific task will be created. 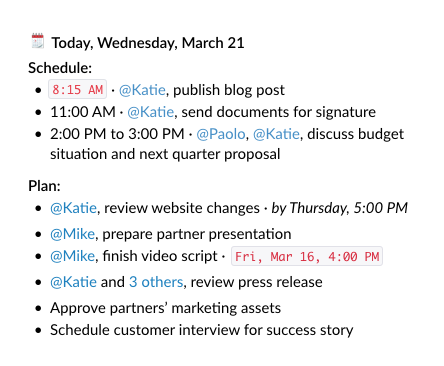 You and your team can now ask questions to clarify the tasks, add more details, share notes and provide updates, all in the context of the specific task. 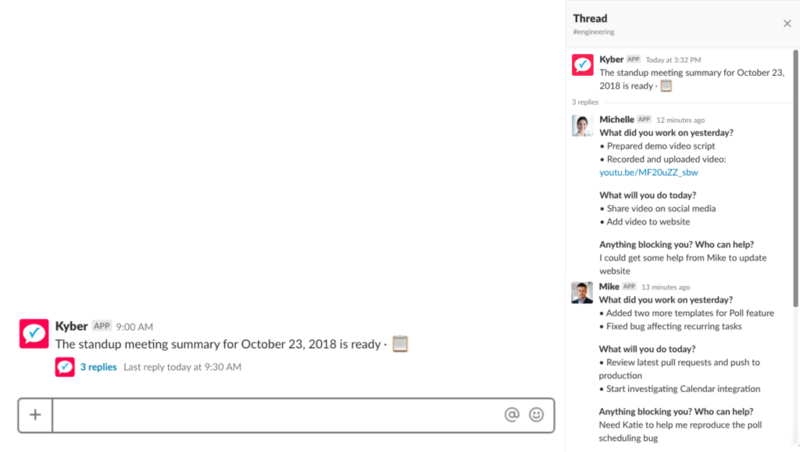 Remember to @mention in the thread any user you want to notify: your comments will be displayed in their “New threads” section in the sidebar of Slack and they will be subscribed to any further message for that thread. To complete a task, type /list to display your list of tasks in either Kyber bot or directly in the conversation. Then, simply click on [✓]: the task will be removed from the list and your team will be notified of the progress. When the completion message is sent to the channel, your teammates can add a 👏 emoji reaction to congratulate you for your work. A team morale boost! See Work on tasks and meetings for more information on how to manage tasks. To view the list of completed tasks type /list completed in each conversation or in Kyber bot for your personal tasks. You can also click on [Filter by…] ➡︎ [🏷 By status] ➡︎ [Completed]. It’s now easy to track the progress of a project on a daily basis, even if you missed some notifications about task completion. You can also use this list to create a report of the things you have accomplished during the week. Polls help your team make decision faster and drive consensus. They can be setup as one-time or recurring occurrence. Once you hit [Send Now] or [Schedule Now], the poll is sent to the #channel at the scheduled time for everyone to vote on. If scheduled, you can edit the poll before is sent by typing /list sent. After the poll is sent, it is also added to the #channel list, accessible with /list. Real time results are shown there until the poll ends. Duration: from 15 minutes to a week, pick how long you want the poll to stay open. Default: 1 hour. Note: while the poll is open, the names of voters for each option are displayed only to the poll creator via a private message on Kyber bot to avoid influencing the vote; when the poll is closed, the names of voters are then shared along with the final results. Once the poll is submitted to the #channel, everyone can start voting on it by clicking 1️⃣, 2️⃣, 3️⃣, 4️⃣. Upon voting, a message to Kyber bot is sent to everyone with partial poll results; click [⟳] to refresh them. For public polls, the poll creator can also see the names of voters for each option. You can also review partial poll results at any time, by typing /list in the #channel or /list sent if you created the poll. Voting again for another option will change your vote. If the poll was configured as public, click 📊 to view who voted for each option. To delete a poll, type /list sent and click [🗑]. Only the creator can delete a poll. Kyber offers a set of pre-built micro-apps that you can easily customize and configure to best meet your needs. Discover below the micro-apps currently offered and their default settings. Finding the best time to meet is a very time consuming chore that requires you to go through many answers and infinite back and forth. Use this micro-app to propose times and let people vote on the preferred option. When the poll is over, the best time to meet will be automatically decided and shared with participants. This handy micro-app let you streamline the approval process for documents, expenses, budgets, time offs and more. Send your request via Direct Message, private group, or #channel to the people that are required for approval. Enter your request in the Approval Request field or simply customize the existing message with a link to the item to be approved. Add what’s on the plan you are working on and let your team vote on. At the end of the poll, you will be able to dedicate the right attention to the highest risk item and make sure your team has all they need to execute it. This quick check-in done in the middle of the week allows you to understand the progress of your projects and identify which teammate is in need for help. Don’t wait the end of the week to find roadblocks that could have been solved with a check-in as simple as this. Automatically ask every morning where your team will be working from. No more manual requests and multiple messages just to know where your teammates are. At the end of the poll, each option will have the list of people working from that location. Tired of wasting time each day thinking where to go for lunch with your team, proposing some options and waiting for consensus? 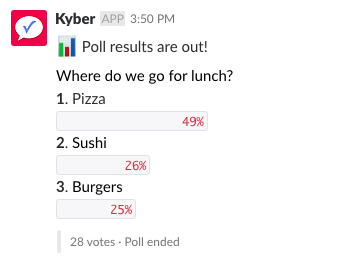 Setup this daily poll with some restaurant or cafeteria options and quickly decide with your team where to go for lunch. Team Sync-ups help you gather information from your team by asking questions and automatically generate a summary report with all the answers. They can be setup as one-time occurrence or recurring. Ideal for standup meetings, surveys, feedback sessions or just to know your team better. Once you hit [Send Now] or [Schedule Now], the team sync-up is sent to the #channel at the scheduled time for everyone to answer to. If scheduled, you can edit the team sync-up before is sent by typing /list sent. After the team sync-up is sent, it is also added to the #channel list, accessible with /list. Duration: from 15 minutes to a week, pick how long you want the sync-up to stay open. Default: 1 hour. Once the sync-up message containing your questions is sent to the #channel, everyone can start answering by clicking [Answer] and filling the questionnaire. You can update your answers by clicking again [Answer] until the team sync-up is open. Click the report button 📋 (or the link to N replies) to view the answers of each teammate. To delete a team sync-up, type /list sent and click [🗑]. Only the creator can delete a team sync-up. The structure of the meeting is meant to promote individual planning and commitment to it, follow-up conversations amongst team members, identification of issues before they become too problematic. Standup meetings are typically run daily in the morning; Kyber automates the process by collecting the answers from each team member and generating a report at the end of the meeting. Asking your team to create a weekly report can help them with planning and accountability, as well as encourage team collaboration by sharing roadblocks and requests for help. This micro-app helps your team easily generate their individual weekly report and lets you keep a pulse on your team and project status. Recognizing the accomplishments of a team is key to build a top performing one. It helps motivating people and reward their effort. Building this continuous reward and feedback loop will show long term benefits to both morale and productivity. Take a break from work with this fun micro-app. Share recommendations with your team about movies, TV shows, books, articles, restaurants or whatever you want! Use these 4 ice-breaker micro-apps to learn more about your teammates and build a stronger connection with them. Questions range from Memories to Inspiration, Fantasy or Fame: use the existing or ask your own. Compose, schedule and preview a message, configure it, send it to your team. With any of the above methods, a form is presented to let you compose the message. Once you hit [Send Now] or [Schedule Now], the message is sent to the #channel at the scheduled time. If scheduled, you can edit the message before is sent by typing /list sent. To delete an announcement, type /list sent. Then click [🗑]. Only the creator can delete a message. The meeting is added to a list shared with the other people in the conversation (e.g. a #channel, a group, a direct message). To send meeting invites, @mention one or more teammates (e.g. @katie, @mike) or an entire channel using @channel. You can also add or remove invitees later with [Invite], available for meetings when displaying the list with /list or when you reply to the invite with [Reply to Invite] at meeting creation. Invitees can use [Reply to Invite] from the invite to display the [Accept] and [Decline] buttons. They can also reply later, at any time, from the list associated with the conversation or their personal one in Kyber bot. and many more. If you don’t add an end time, a default duration of 1 hour will be used. To reply right away to meeting invites you can click on [Reply to Invite] in the original message. If you missed that, you can type /list at any time to display your list in either Kyber bot or directly in the conversation. Then, simply click on [Accept] or [Decline] to send your reply. If you accept, the meeting will be kept in your personal list and you will be notified at meeting start. If you decline, the meeting will be removed from your personal list; in case you change your mind, you can still find the invite in the conversation list and update your answer there. See Work on tasks and meetings for more information on how to manage meetings. 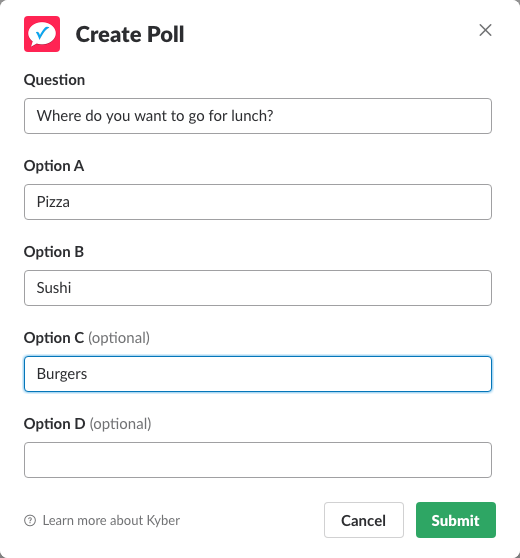 Tasks, polls, announcements and meetings created with Kyber are intelligently organized in time-based lists shared with the members of each #channel, group, or direct message where they were created. Each team member has also a personal list: it contains private action items and those received by others, directly or in #channels. Kyber list is an innovative productivity concept that allows you to effectively plan your day and get more done. To view tasks, polls and meetings organized in list, type /list. You can also display each list by clicking on [Show List] when items are created or updated. The Compact mode allows you to view your list in a compact way and helps you get an immediate sense of what needs to be done. The Edit mode lets you access a more advanced view with a set of actions per each item, such as [✔], [✏️], [👤], [📎], [Accept], [Decline], etc. See Manage lists for more details. You can switch between modes at any time; your selection is maintained across sessions in case you have a preference for one mode vs. the other. When Kyber is installed, a Kyber bot is added to your team. 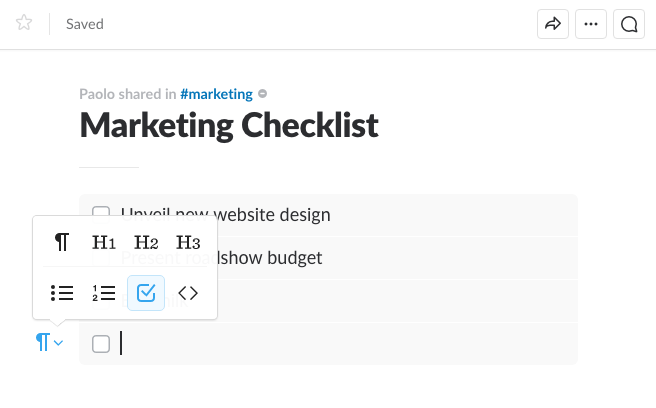 Look for it under Apps section in Slack sidebar. Kyber bot offers a unified dashboard to view and manage all tasks and meetings: no need to switch to an external website or app to have all your work under control. This unique approach helps you saving time, keeping focus and ultimately getting more done. When you type /list, Kyber bot starts displaying your personal list with your tasks and meetings for the day, sorted by time. 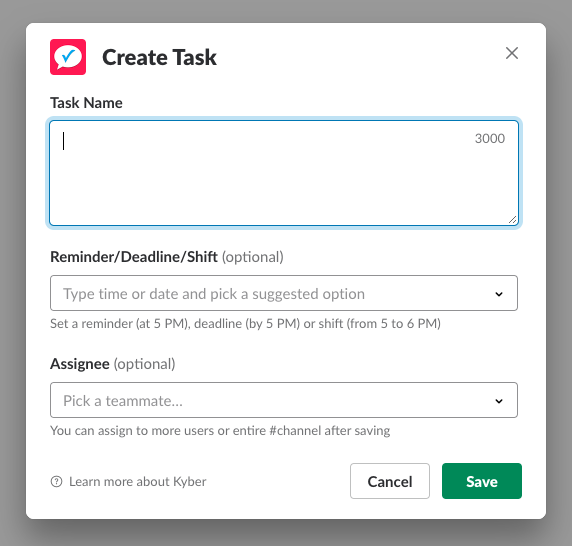 Your personal list includes not only your private tasks created with /task in Kyber bot, but also any task or meeting received from others in any #channel or direct message. A complete plan of your day. If you also want to view the lists created in any public #channels, simply click on [Browse lists ▾] and pick a channel: the list for that channel will be displayed. Need to jump to that channel? Click on the name at the top of the list and you will transferred to that channel to start chatting there. The second number (“20”) is the total items for that channel, spread across other days or the Someday section. If you are already in a channel or direct message, you can type /list directly there while messaging: the list for that specific conversation will be displayed. Using /list in a conversation is very convenient when discussing list items with your teammates. To manage the items in each list click on [Edit] to display various actions. When you type /list, the list for the day is initially displayed to let you immediately know what needs to be done today. Each item listed in the menu is followed by a number in parenthesis (e.g. “Tuesday, Jul 11 (4)”) showing how many tasks or meetings are present in that conversation. If you want to immediately display a specific view, add it after /list (e.g. /list Monday to see Monday list). See each section below for specific details on /list filter keywords. The “By day” view works like a calendar, letting your switch between days. Look at the number next to each date to know if you have anything scheduled. More status (e.g. Assigned, Unassigned, etc) will be added in the near future. To directly access the list for a specific user, type /list followed by their @username, e.g. /list @mike. With the Kyber channel on IFTTT, you can import or export data between Kyber and the apps you use the most. Create tasks from content on other apps, sync calendars, generate reports and more. To connect Kyber with IFTTT, type /kyber IFTTT and follow the one-time configuration steps. Then start connecting apps through existing IFTTT applets or create new ones. When Kyber is installed on Slack, every teammate can start using it immediately, without having to create yet another account. Those users that never interact with Kyber or never receive a task or a meeting invite will never receive any message from Kyber. 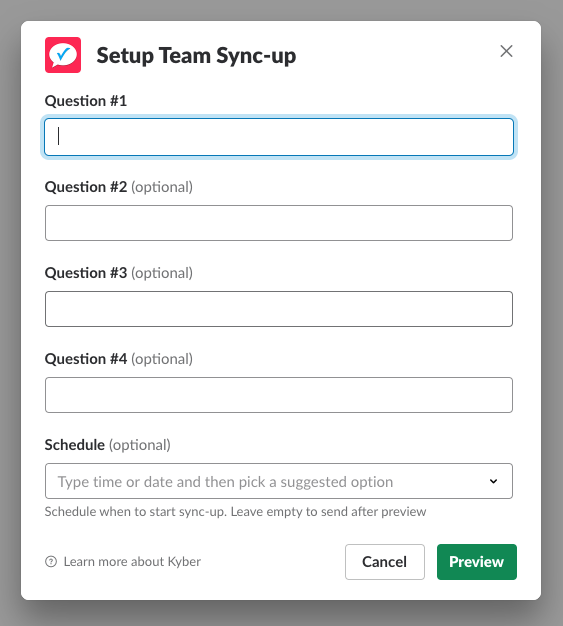 If you are experiencing time zone issues with your reminders or calendar events, simply type any Kyber command or click on any button: Kyber bot will automatically update your time zone based on Slack settings. Note: make sure you have Kyber bot installed under Apps section on Slack.